Five hours, and fairly time-consuming rather than difficult. Since I have owned the car and knew I would have to re-wire it I knew that the stock ammeter was not going to be a working option. My American Autowire Upgrade loom strongly recommended not to use it as well. The main reason they don’t recommend it is that the single wire alternator I now have is 100amps and not the tiny 48amp as stock. The amount of amps going to the ammeter would probably melt something and destroy my car via a fire. This leaves the options very limited to say the least, I could blank of the hole which would look rubbish, put a clock in there, better but not ideal or find somebody who has done some work to make a bespoke gauge very expensive I expect. I have investigated if anybody has done this before which of course they have with various results. They can look out-of-place being new with old, or only seem to work with the stock loom, again not an option for my upgrade wire loom. Many hours and thoughts have gone into looking about in old car accessory shops, online and eBay, and I think I have found a good alternative to the stock ammeter. I purchased the gauge from eBay in the end and it was shipped over from the far east which only took a couple of weeks to get here. My thoughts were along the lines of, it’s not a lot of money to wreck the meter if I have too and its worth a go. I gauge I found a VDO gauge that was plain black and white and the style of letting matched the stock gauge look. There is a wire from the back that will light up the meter via single white LED to only show up the gauge range at night so it wont flood the rest of dash. The only down side I could see was this was a big gauge depth wise due to the casing and the fulcrum of the gauge was at the bottom not the top as the other gauges. This modification was going to require me to drill the back of the dash case. I made the decision this would be worth it. If you don’t want to drill your dash case back then this not for you! Obviously not concours but you will not see the drill marks from behind the dash, yeah I will get the anoraks saying “ooh, that’s not a genuine part is it?” My car is not going to be stuck in a garage cleaned and put away again, my car will be driven and enjoyed, that gauge will help me identify if there is a problem. Tip: Before I started this little project I did check the gauge to make sure it worked. I crocodile clipped The terminals and touched the terminals. Which sprang the dial into life. This was the easy bit, the ammeter was held to the back of the dash by the standard two posts that also served as the connections from the alternator to the gauge. 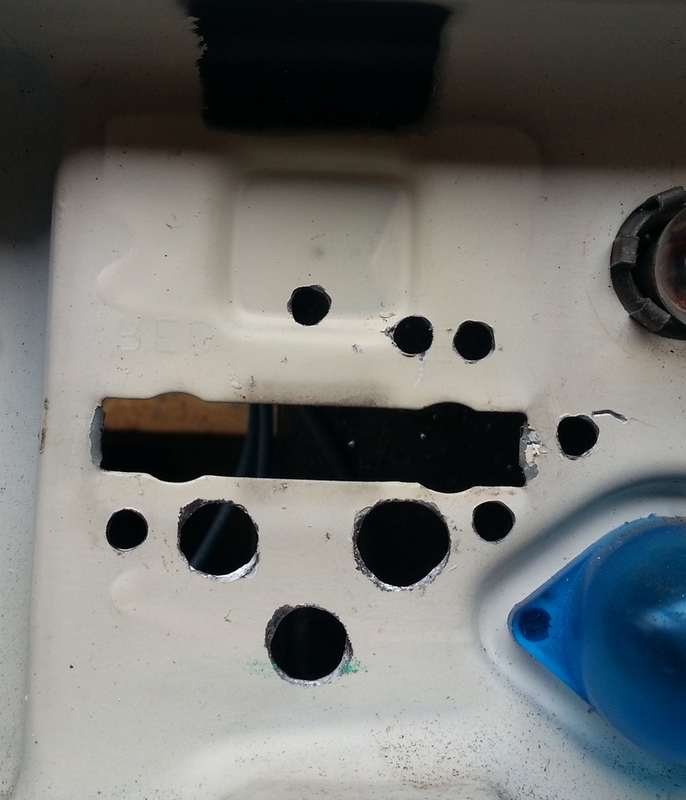 Remove the screws to the back of the dash front and the back will pull away. This will leave the plastic lens behind and the metal plate between the back and front. My dash front is wrecked, faded, worn, cracked and the lenses cracked so I will replace them all at the same time when I put it back together again. Once separated undo the nuts on the back of the gauge and the ammeter will be released to pull out. As far as I know this should still work, but I am not sure. The damaged dash with broken screw points and fittings, the lens is one long piece of plastic that fits behind the dash front. In fact there were only two screw points that I could use on this dash. Once the meter was out I treated the small surface rust areas and allowed it to cure. The next part was to take the VDO meter apart as the casing was to deep to fit in place and would not allow the gauge to sit in place. The inner workings were a little longer than I hoped for but it was still worth the go to make it fit. Now was going to be the fun bit, or not so fun bit, so I would need to have lots of patience when carefully marking up the positions. The horizontal cut out at the back took the gauge just, and the pillars were out to the max width. With the gauge located in the rough position I could see the dash front and metal plate would fit around the gauge, but it would need to be seated almost flush to the back. Lucky the face is a fairly thick plastic and would give a little when positioning. The surface mounting presented its own problems as the solder on the circuit board would be touching the dash metal back and probably cause the gauge to short or fail. The second problem is the terminal posts for the live and ground connections would need to be drilled through. To fix that I lined up the gauge in the position and pressed slightly down onto the backing paint. This then marked the paint for the location of the terminal posts which were obviously the next high points. 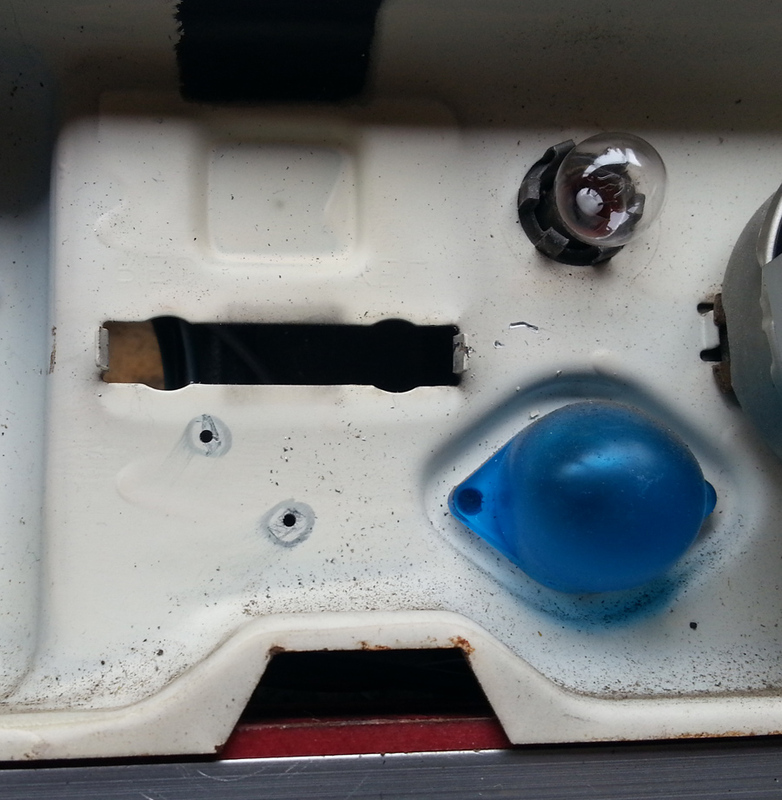 Starting with a tiny pilot hole I drilled through the dash back. Next I found a drill size (7mm) that was bigger than the posts with the nuts still in place. The base of the gauge also has two tiny fitting bolts that were now holding the mechanism to the circuit board. These would obviously earth out again and not allow the dash to seat correctly. The test fitting showed that the locating lugs for the ammeter location were now holding the gauge proud. Long nosed pliers bent the lugs out-of-the-way to the other side which cured that problem. Same principle again to fit the gauge down and then slightly press to mark the paint for the location of the two small bolts as these were the next high points. 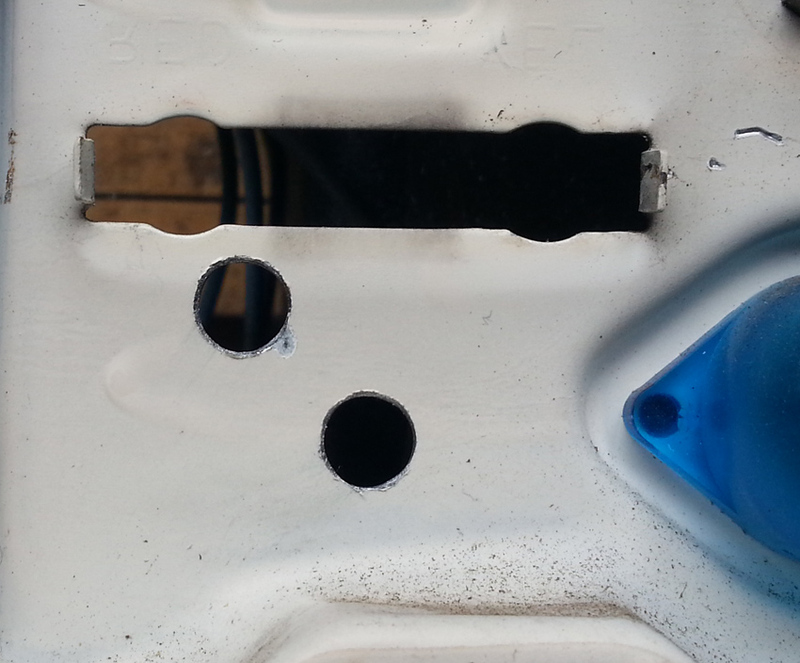 More pilot holes and then larger holes to allow clearance from the metal back. The next part was the solder on the bottom of the gauge, this was slightly proud and I decided rather than bend the plastic gauge face to fit I would drill out the location of the solder in order for the circuit board to sit in a recess and not interfere with the mounting. The final part was to allow the lighting wire through the back case. There is a slight recess in the back that just above the gauge. I would drill a small hole for the wire here, in fact I made two holes, one at the top and one at the side on the right to allow me an option if I needed it to piggy back of the lighting wire for the gauge next to it. Holes made and slightly made oval to allow adjustment that I needed, lugs also removed now. Holes and back plate shown before rust treatment applied here. With the gauge removed again, I applied some FE-123 anti-rust coating to the back. This would seal the drilled holes and also form a protective layer between the dial and the gauge. 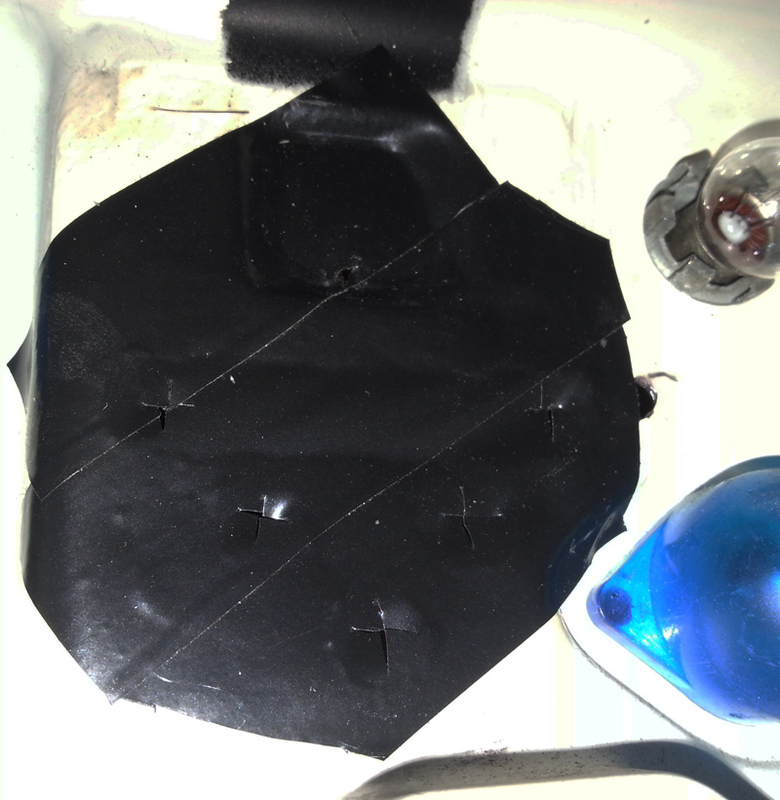 Once that had dried I then cut strips of electrical insulation tape and stuck that to the back case. Carefully I cut a cross in the middle of the holes that would need the posts passing through them, I did not remove the holes completely as this would also provide additional insulating again against the metal back. The solder would not come through the insulation tape over the holes and would just stretch a little to allow the flush seating. As an extra precaution I got some heat shrink tubing and cut some small lengths off just a fraction longer than the bolts on the back of the circuit board. A quick flame of heat reduced the tube to form the additional insulation from the back plate. I then bolted the gauge down using the insulating strip originally on the ammeter which had to cut it in half as the holes were just not far enough apart. This is an optional step obviously as you don’t need to do this if your dials look OK. Mine on the other hand were looking dull and tired. While the case was apart I decided to repaint my gauge needles. They were orange from the factory to start with and they are now just about a dirty yellow if not plain plastic. These dials are so fragile so you need to take some very special care. I cut some small squares of plastic just slightly longer than the needles. Place the strips of plastic between the needle and the face of the gauges, the plastic (or thin card) will stop any paint getting onto the dial face. I previously purchased from Amazon some flourescent orange paint used for modelling which was the smallest size I could get. Now carefully paint the needles with a soft artists brush. The new volt gauge had a white plastic needle that took the paint well. Once the painting is done drying remove the protective plastic and allow to dry. Now all the dials were black and orange and they all matched. 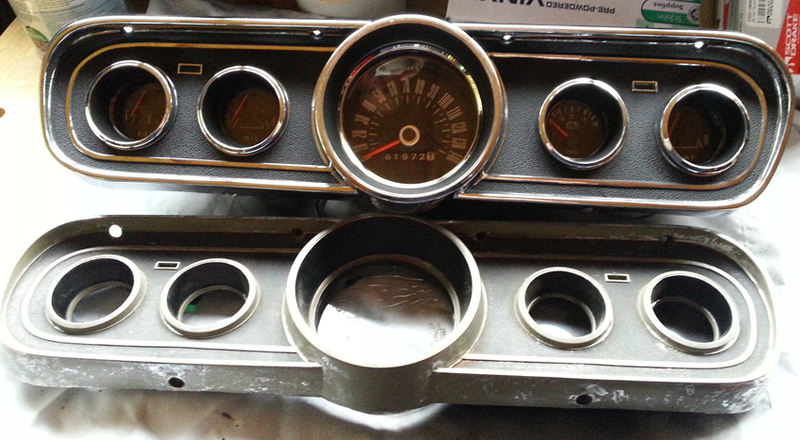 Once the dials were dry I got the new dash face and lenses in place on the bench. The metal plate was carefully located onto the base making sure the volt gauge was seated where I wanted it to be, a small adjustment was needed as I suspected and the oversized holes allowed for the movements I needed. Between the top of the volt gauge needle and the metal plate the clearance was around one or two millimeters and would not touch the plastic lens. Replace the rubber mounts back into the dash front. Using the new self tapping screws I bought I screwed it all back together. The wiring was looking to be simple enough, I need to find the common wire for the dash lights and attach the wire to that connection. I replaced a bullet connection and double crimped the wires and also soldered the wires together. The negative or ground side of the gauge I crimped on a ring terminal connection, the other end of approx one foot of heavier cable for a direct earth connection again got a ring connection fitted. The ground pillar I marked up with a black permanent marker as well. Marking up the back plate as well in case I have to remove it for some reason with the permanent marker. The positive side will be a switched live feed direct from the fuse box and that will be the job done. I think it looks really good and period for the car. Yes I could have got a top down dial to match the others but they had colours all over them and didn’t look right to me. I am satisfied it looks good, it will work fine, be more accurate and I don’t have a full 100amp feed to my dash area. The repainting of the dials was a perfect match to the original that was not exposed to the light behind the metal plate. Old and new side by side, unfortunately the camera does not do justice to the fluorescent paint. I had to drill my dash case which I was not to happy about but the benefits out way have a gauge that don’t work. The time factor was long as I was taking my time to get it right. You could get a different gauge and not have to drill its your choice, but as I say this looks good and right for the time. I would liked a top down needle but I didn’t find any I liked. So I have one gauge going the other way. The fact I expect it to be pointing in the middle most of the time shouldn’t show too much. This was a cheap swap out in comparison, but it looks so much more. The difficulty is the aligning and the drilling. I also made the holes bigger than I needed, this was to allow me movement to realign the gauge if I needed to. The fractions of an inch can ans often make the difference of the look and finish. Would I recommend it? Only if you have too because you may have upgraded your alternator or gone down the one wire route like me or maybe your ammeter has gone home. Like I say a bespoke and slightly better fitting gauge would be nice. Perhaps in time there will be one and I will replace it again. Until that time I am happy with what I have now made. I COVERTED MY 67 F100 AMP GAUGE TO A 1991 VOLT TO GET RIDE OF AMP. AFTER INSTALL, PAINTED NEEDLE TO MATCH REST OF PANEL. THE GAUGE SWINGS FROM TOP JUST LIKE AMP GAUGE. A TRIP TO WRECHING PAID OFF. GAUGE PLUGS INTO PANEL ON THE 91 & WITH A LTTLE WORK ON 67 PANEL WILL LOOK FACTORY. I’VE READ SEVERAL WAYS TO CONVERT BUT I FOUNDTHIS TO BE CLOSE & STILL HAVE CORRECT SWING & LOOKS.THANKS FOR EVERY ONES THOUGHTS. Nice, I would prefer the swing to be from the top, but it doesn’t look out of place either from the bottom. Like you say the secret is to match all the needles up. The gauges are so delicate tho. Thanks Mike, kind words. I am so with you about drilling, but a dead dial would wind me up even more. You could always stick a voltage under the dash just until you are happy with the voltage output. You are 100% correct. The 1 wire was a simple install but i wanted to keep an eye on it. Disconnect the red & yellow ammeter cable and it will stock no drilling. Nobody is going to see the back of my dash and i was pleased how it came out. I dare say yo7 can get some very slim line volt gauge that may fit with no drilling at all in the stock gauge cluster. Let me know how it goes. The blog is great btw. Thanks for all the great tips. Thanks for the kind comments. I believe it should be a full load 12 and not wired after the equipment as it were, otherwise you will be seeing the load from the equipment and not from the alternator. I also fitted it with an in line fuse as well just to be sure. There were three wires, poss, new and a feed for the light etc. Simple to fit and quite heap from eBay. Or get some real nice racing ones would look cool under the dash. Or you can fit them on the pillar for the windscreen and slim line, they look cool as you don’t have to look down under the dash as they are in eye line. Both look nice it just depends on your look u want. Let me know how it goes. All the best. Mart. Nice job, it looks great. 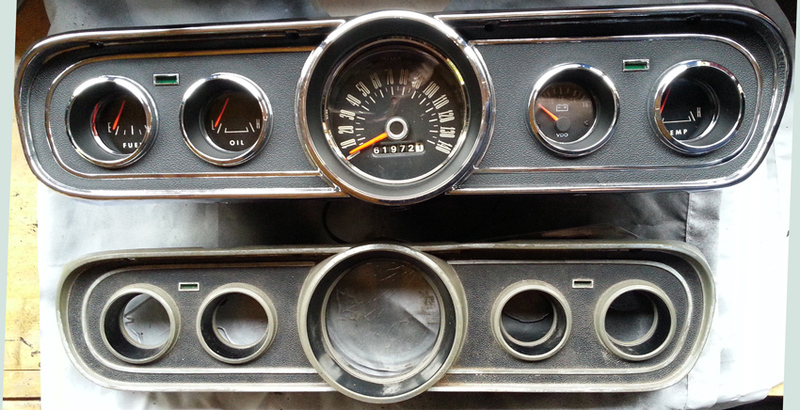 I’m planning on putting a voltmeter in my 65 Mustang, hanging under the dash. Any tips for wiring?